It is said that India’s knowledge of extracting colour from the green leaves of the indigo plant, dates back to the Indus valley civilization. India is thus seen as a forerunner in dyeing and printing — the techniques being closely guarded secrets within the family and passed on to the next generation. In the early 1900s more than 30,000 acres of land in India was involved in the cultivation of indigo and soon became the most sought commodity for the British, when they landed in India. The Calcutta port is said to have shipped as much as 4000 tons of indigo to Britain, in a year. The blue Indigo dye is highly versatile and can be used to colour any kind of fibre and is also a vital constituent for creating other colours such as greens, purples and black. It was as far back as 1993 that I visited the tiny village of Pipar with a friend. Just an hour’s drive from Jodhpur, it seemed unbelievable that this sleepy looking village could possibly be the nerve centre of the natural-dye industry of Rajasthan! At the time Pipar was said to be handling a large chunk of the indigo dyes and prints that had already become the rage both in India and abroad. The largest dyeing and printing unit in the village was that of the Shahabuddin family. Shahabuddin who had passed away a few years before, had been a master printer and much in demand. He however had no head for figures and it was left to his wife to manage the financial side of the family trade. Married at the young age of 13 years, she showed an uncanny knack for figures and helped her husband in keeping track of the family finances. We met Yaseen his eldest son, who had taken over the unit and he and his two younger brothers had begun to expand the business with the help of their wives. They divided their work — the men folk handling the dyeing and printing, while the women helped in the preparation of dyes, sorting and packaging. According to Yaseen, a business of this kind could only succeed when the whole family is involved. At the time, Yaseen and his brothers had developed their traditional craft into a flourishing dyeing and printing unit. A recent conversation with Yaseen now in his fifties, made me marvel at the changes at Pipar. The Shahabuddins appeared to be among the last few of Pipar’s families involved in the dyeing and printing trade. The other families had decided to look for more lucrative occupations and decided to move to the big cities. Yaseen and his brothers were working hard to keep their trade alive, but it was not easy. They now have 25 trained helpers to assist them. In place of the ramshackle shed and tiny house where they earlier lived and worked, the three sons now had separate two-storey houses. 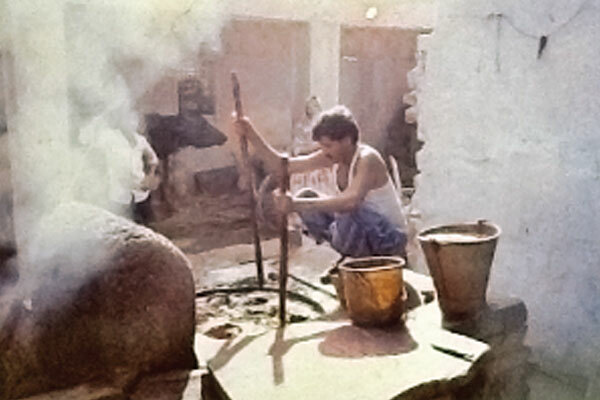 The Shahbuddin workshop with its ancient vats of dye however has remained intact since the water in the vats is never changed and the vats never moved. Like a family heirloom, the older the water in the vat, the better the colour. The Shahabuddin family continues to use the earth colours and dyes made out of vegetables and dried fruit. Different colours being created by using natural roots and vegetables - turmeric for an ochre shade, the skin of the pomegranate for a reddish brown, sunflower petals for a cream background, while black calls for soaking a few pieces of iron in a mixture of jaggery and water for two and a half weeks. Toiling over a vat of indigo dye in which the water hasn’t been changed in a generation, is a difficult task, especially in summer, when the desert heat hits you. The indigo dye used by Yaseen and his brothers is created in the enormous vat inherited from their father. The indigo in the vat is mixed with calcium hydroxide (lime) and depending on the requirement, the quantity of lime is increased, to achieve the desired shade. The fabric is first dyed in the vat, then soaked in clear water for three days and then hung out to dry for one whole day. This process is repeated four times and each wash makes the dyes hold faster and the indigo colour brighter. The Pipar prints used to be rather basic, both in design and colour and seldom featured more than two colours besides the base colour. There has been a change hear too, with new designs and more subtle layered prints. Indigo dyes are more popular and more expensive, than the other dyes used in this region. While chemical dyes with their more western shades and pastel colours are used in many centres for printing in Rajasthan. It is heartening to note that Yaseen and his brothers are still continuing their traditional style of work and managing to find a good market for their craft in the modern world. The blocks for the prints are made of Rohida wood, indigenous to the state. The more intricate blocks are usually made in Jaipur, while the simpler ones are make locally at pipar. Yaseen ensures that the old blocks are preserved, as he finds that many designs made years ago by his father are finding favour with new buyers. There was a time when the minimum order accepted by the brothers was for 100 metres of any one colour or design, ensuring that the same base colour and design for 1,000 numbers, to make the effort economical. The Shahabuddin brothers now supply goods worth more than 150,000 to the Desert Artisans Handicrafts Jodhpur in which they and their 25 workers are all shareholders. Now that is what one calls progress!